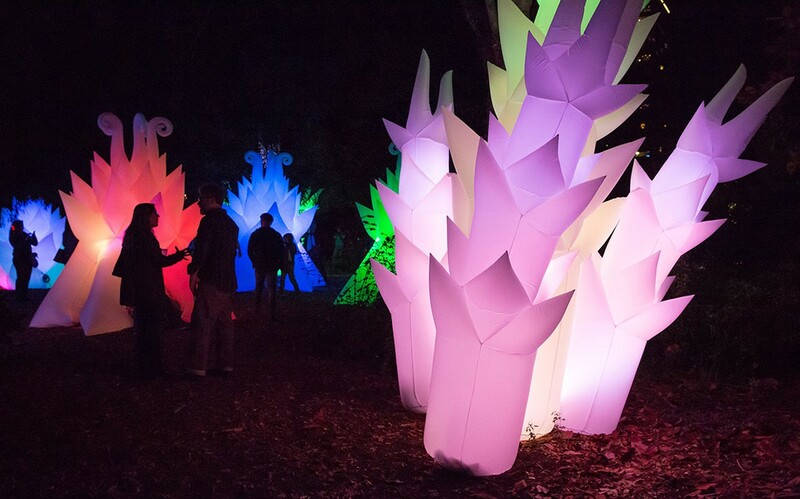 The Gardens at Lake Merritt transform into a glowing, enchanted sculpture park for the Oakland Autumn Lights Festival this weekend. Stan Clark's "Astro Botanicals" will light up The Gardens at Lake Merritt again this year. 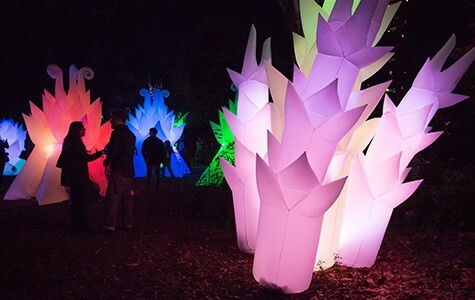 On the evenings of October 16 and 17, The Gardens at Lake Merritt will come alive with dozens of glowing sculptures from more than one hundred local artists for the Oakland Autumn Lights Festival. For those unfamiliar, the event takes place in the seven acres of themed, manicured gardens adjacent to Lakeside Park in Adams Point. While the gardens are typically only open during daylight hours, Autumn Lights begins at dusk and transforms the horticultural centers into enchanted landscapes that highlight some of the Bay Area's most forward-thinking installation artists. "Autumn Lights is a place where makers and burners meet nature," said Victoria Rocha, the park supervisor and chief curator of the event. Rocha founded the festival four years ago as a fundraiser for the gardens' entrance plaza re-design project, which will outfit the park entrance with an ornate, metal gate and regal landscaping once it's completed in 2016. Originally envisioned as a lantern festival, Autumn Lights has grown into a dizzying visual spectacle with an emphasis on large-scale works that utilize new technologies and unconventional materials. "When I met the artist community in Oakland, I was blown away with what they could accomplish," said Rocha, referring to the festival's expansion. As far as must-see artworks go, attendees should look forward to the giant, inflatable fabric sculptures of Vallejo artist Stan Clark, which he refers to as Astro Botanicals. The otherworldly, abstract forms take on organic shapes that resemble alien plant life, glowing with soft, pastel hues of colored light. Keiko Nelson, an internationally exhibited East Bay artist originally from Kyoto, Japan, will install sculptures of doves made from chopsticks in the Torii Garden's ponds. And just back from Burning Man, Gray Davidson's 28-foot-long metal serpent sculpture — which will breathe actual flames — is slated to be one of the most eye-catching works at the festival. Some Autumn Lights artists have opted to use the gardens' flora as their canvases. Designers from the collectives Imaginary Photons and Coil Lighting, for instance, will collaborate on an LED light piece that will illuminate the gardens' trees with a multicolored glow. Rocha and her team from Oakland Public Works will use LED lighting and a sound piece to convert the gardens' rare collection of high-altitude palms into an audiovisual installation that evokes the experience of being underwater. In addition to transforming the gardens into a luminescent sculpture park, this year's Autumn Lights will also feature artwork for sale, food trucks, a silent disco dance party (in which festivalgoers wear headphones instead of listening to music through a PA), fire dancers, and musical performers. Attendees are encouraged to wear creative costumes to complement the installations. The festival is an opportunity to appreciate the beauty of one of Oakland's most beloved public spaces — and see it in a whole new light.